Over the years, the Musée d’art contemporain de Montréal has developed an expertise aimed at meeting the museum education needs of its different audiences. Visitors can access this expertise through three main programs offered by the MAC: Art Workshops, Interactive Tours and Cultural Activities. Depending on visitors’ particular interests, they may choose any one of these activities or combine them to make the most of their visit to the MAC. Tours focused on dialogue and discussion, for all visitor categories. The overall objective of the Interactive Tours is to enable visitors to discover the MAC’s collection and temporary exhibitions. 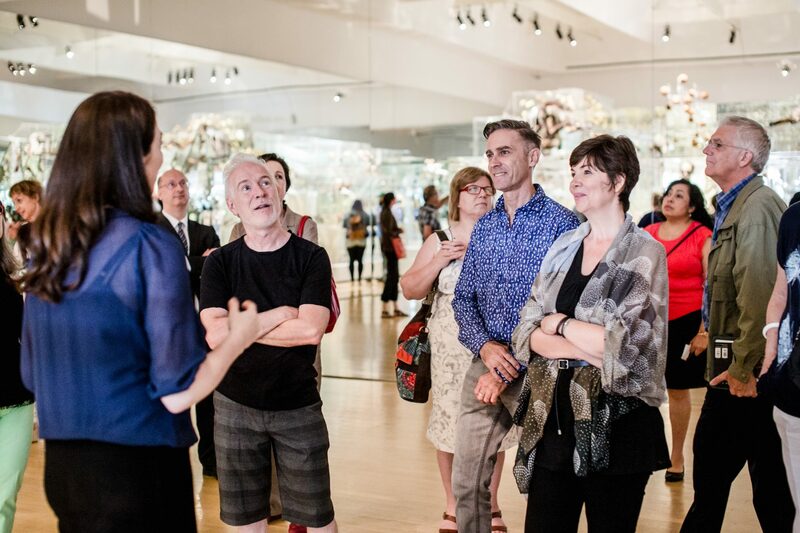 The tours are designed not only to provide information on the works on display, of course, but also to offer a space where the public and the educator can meet and exchange ideas. They are intended for all visitor categories: preschool and school groups (elementary, secondary, college, university), community, professional and tourist groups, as well as solo visitors. Various educational programs that include tours are also planned in conjunction with the MAC’s Art Workshops in order to present an art experience combining observation of works with hands-on experience using different techniques and materials. Encourage visitors to draw connections between contemporary art and society, and between contemporary art and their daily lives. Our Interactive Tours are designed to develop visitors’ ability to appreciate works of art, rather than imposing a single interpretation. The educator encourages discussion and questions, guides participants in their observations and facilitates the sharing of ideas. With preschool and elementary school groups, a playful, imagination-centred approach is adopted. Offered by the MAC in collaboration with the Claudine and Stephen Bronfman Family Foundation since fall 2010, SéminArts is an educational program providing an introduction to the art of collecting contemporary art. In an atmosphere that encourages discussion and the sharing of ideas, participants discover the art world and the workings of the art market through five sessions with various players in the arts community, includings artists, gallerists, private collectors, corporate collectors and exhibition and museum curators. In addition to its scheduled series, SéminArts regularly offers à la carte activities (tour of Art Toronto, visits to other types of art venues, meetings with diverse stakeholders). The MAC’s Art Workshops offer visitors of all ages an opportunity to enhance their aesthetic experience by trying out various techniques, media and materials related to a concept or theme found in a work or exhibition. By encouraging artistic expression, they help develop visitors’ desire and ability to create. Develop visitors’ creative abilities through personal artistic expression and give them hands-on experience with various gestures, techniques, processes, materials and tools as means of two-dimensional and three-dimensional representation. The museum setting in which these workshops take place offers much more than a chance to simply encounter and personally observe works of art. The ready access they provide to the art objects and the way these works are presented allow us to develop a special pedagogical approach that fosters a productive relationship between seeing and doing. Contemporary art favours artistic choices that venture far from conventional means of representation. It reflects both a certain artistic legacy inherited from the past and the concerns of the present. One of its main features is its eclecticism. The diversity of works, subjects, styles, techniques and materials stimulates and fuels the imaginations of receptive visitors. After personally observing original works, an exercise that helps sharpen the gaze, workshop participants experiment, discover, reinvent and create. The resulting works may be modest, but they are truly personal and tangible. Creating images means producing them, putting them into concrete form. The hand works with the eye, enabled by discipline-specific means including gestures, techniques, processes, materials and tools. It’s well known that a hefty dose of creativity clears the mind and refreshes our ideas, stimulates our imagination, develops personal expression, sparks many different emotions, promotes self-esteem, enables us to externalize our sensibility, prompts a desire to communicate and alters our perception of the world. Participating in the MAC’s workshops means enjoying a special opportunity to reinvent yourself! The Workshop/Tour Combo is the ideal way to make the most of a visit to the MAC. This two-hour educational activity combines an Interactive Tour of the current exhibition with an Art Workshop that ties in with one of the works on display. It is intended for all types of groups: preschool, school, community, tourist and professional groups, as well as for solo visitors as part of our Family Sundays and Creative Moments programs. Designed for both young and old, for both contemporary art lovers and neophytes alike, our Family Sundays offer children ages four and up, teenagers and adults a relaxed atmosphere in which to explore original works of art and discover new ways of creating through a hands-on approach and under the guidance of a welcoming, energetic staff. This program of activities revolving around artistic expression offers adults an opportunity to become acquainted with original artistic practices and experiment with various aspects of the creative process. Each session presents a new visual or media arts activity, with a different subject, theme, technique and medium, offering participants a multitude of perspectives on the many different creative possibilities offered by the works on view at the MAC. By way of introduction, each series of activities starts off with an Interactive Tour. This program invites participants to explore and experiment with new technologies for producing computer-generated images while mastering an innovative approach to the creative process. Digital images and their multiple variations are revolutionizing the forms of expression used in visual culture and rapidly transforming the way we represent things. The growth of new media has led us to inaugurate a brand new digital arts lab in keeping with today’s techno world. Display images produced in the workshops in a virtual gallery (website). Inspired by a theme connected with the works on display, the MAC’s Day Camp taps into participants’ energy and creativity by offering them a wide range of activities, both artistic (drawing, painting, sculpture, silkscreen on T-shirts, digital arts) and recreational. The program aims to develop youngsters’ creative capabilities as they learn about contemporary art in a fun, original way. Recognized for its high standards of quality and its continually updated program, the MAC’s Day Camp has won four awards of excellence from the Association des camps certifiés du Québec: for Innovation in 1997, and for Best Program in 1998, 2006 and 2010. Every year, the MAC plans and organizes the Max and Iris Stern International Symposium in addition to co-organizing symposiums with researchers associated with Québec universities. The goal of this program is to make the research of today’s leading thinkers accessible to the public. These scholars work in a variety of fields, such as art history, philosophy, literature, communication theory and other fields that shed new light on contemporary art. Through its cultural activities, the MAC contributes to the advancement of knowledge on recent developments in the art world and draws attention to the relationship between art and various social and aesthetic issues, thereby highlighting the central role of the visual arts in our society and the unique perspective they offer. The MAC offers several ways to connect with its exhibitions, including gallery talks by curators and artists, conversations between exhibition curators and artists, and lectures by artists on their artistic practices. The aim of these talks is to offer visitors an opportunity to hear the perspective of the main actors involved in current exhibitions, while opening up a space for contact and dialogue. Since 2006, Musée d’art contemporain de Montréal has held an international symposium known as the Max and Iris Stern International Symposium. From the time of the MAC’s founding in 1964, Max and Iris Stern contributed significantly to its growth by enriching its collection with many gifts, including works by Hans Arp, Paul-Émile Borduas, Emily Carr, John Lyman and Jean Paul Riopelle. The goal of this annual event is to make the latest research of today’s leading thinkers accessible to the public. These scholars work in a variety of fields, such as art history, aesthetics, sociology and literature. Through this commitment, the MAC’s aim is to foster a greater understanding of contemporary art and pay tribute to Max and Iris Stern by promoting their vision on the international scene.